Sega Genesis Game published 30 years ago by SEGA of America, Inc.
World Championship Soccer © 1989 Sega of America, Incorporated. 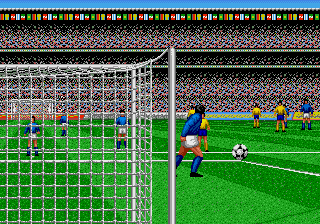 World Championship Soccer for the Sega Genesis was released in September 1989 in North America. It was then re-released in 1992 as a "Sega Classic" edition. [US] Sega Genesis (aug.16, 1993) "Triple Score - 3 Games in 1 [Model 1702]"